Alex the Allegator 2 is a neat little board game for one or two players from Free Lunch Design. From the official site, your objective is simple: "...Place your tokens in turn on the board or slide a row or column. All in order to wipe the board from your own tokens. But beware, once the all the tokens of any player are gone, you must also have the highest score to beat your opponent. The game was originally written for the Allegro Speedhack 2001 where it won the the award 'Best Overall Game'." Alex 2 is one of those board games that are deceptively simple, but grow on you after a few games. Getting rid of your opponent's tokens is difficult enough, but the additional requirement of getting the highest score makes game much more challenging. The relatively small size of the game board helps strike a good balance between difficulty level and game length, making it possible to finish a game in 15 minutes or less. 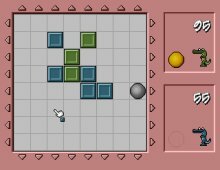 If you enjoy coffee-break board games that are more challenging than a game of Solitaire, take a look at this small but fun freeware gem. Highly recommended!